WWE SmackDown Results (7/31): Jeff Hardy Returns, More! WWE SmackDown Live Results (7/31): Charlotte Flair Returns, Orton Strikes Again, The Bar vs The Usos, More! 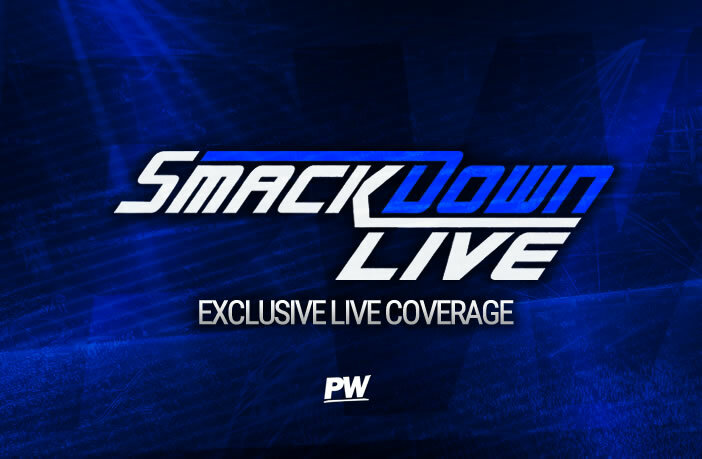 We kick off this week’s episode of SmackDown Live with Renee Young in the ring as she introduces the number one contender to the SmackDown Live Women’s Championship, Becky Lynch. Renee asks how she feels to be back in the title picture. Lynch admits she did doubt it would never happen, but she kept working, and she has kept thinking about it since. Becky Lynch says it is the honor and the pressure of knowing you have a target on your back to be the champion, she says she wasn’t born to be a champion, but she fought to be a champion. Becky says it will be her honor to walk into WWE Evolution as champion and here comes Carmella. Carmella says normally she would come and make an excuse for her loss, but claims that is not the case today. She says she was so focused on their title match that she didn’t think about the Evolution announcement, and then it hit her. She says they aren’t representing Raw or SmackDown but every single woman who has ever stepped foot into WWE. She says she has failed because she shouldn’t have torn people down, and she admits that Becky Lynch has always been one step ahead of her. Carmella states that the WWE Universe loves Becky, but most hate her, adding that she tries to block out the haters on social media, saying it is exhausting. Carmella says she puts on a brave face and she couldn’t be more excited to tear the house down with someone she has always looked up to and offers to shake Becky’s hand. Whilst distracted James Ellsworth’s music plays and Carmella attacks Lynch. Carmella then gets out a chair and CHARLOTTE FLAIR returns to save her best friend, sending Carmella out of the ring. The Usos are shown backstage cutting a promo, telling The Bar they are ready as well as asking Bludgeon Brothers to shine the Titles Up real nice… they face The Bar next. After the break Paige tells Carmella she should be ashamed of herself and Carmella tells her she will never be a champion again. Paige announces she will face Charlotte Flair tonight and if she wins, her title match at SummerSlam becomes a triple threat. Before the match even begins the team that the winners of this encounter will face… The New Day head down to ringside to their very own pancake announce table for this match. In the ring, Jey Uso gets the upper hand to start the match, sending Sheamus to the outside early on. Back from the break and Cesaro is in the ring, cutting it in half and stopping Jey from being able to tag his brother, yet he brings in Sheamus and both men clothesline Jey to the mat. After Sheamus attempted to dive into Jey at the ring post the Uso smartly sidestepped and finally got the tag as Jimmy heads in hot and drops Cesaro with a Samoan Drop. Jimmy then attempts to hit his fathers classic running rear to the face, but Cesaro avoids and spills to the outside. Jimmy then goes flying over the ropes to take him out but Sheamus sacrificed himself and back in the ring Cesaro pushed Jimmy from the top turnbuckle straight down into the barricade. Back from the break and Sheamus was sent flying to the outside but Jimmy Uso flew from the top ropes to wipe out Cesaro himself. After a major Superkick to Sheamus Jey then hits a Frogsplash but just as it seemed like the match was over, Cesaro breaks in to stop the pinfall. Cesaro is then thrown to the outside and both brothers climb to the top ropes hoping for a double Splash but Ceasro returns and catches Jey with an uppercut. Sheamus then gets his knees up for the next and quickly rolls up Kimmy for the victory as The Bar advance. After the match, The Bar invite New Day into the ring and they square off until Sheamus and Cesaro walk away. Next week the two teams will compete in the final of the tournament. Renne asks Charlotte how she feels and Charlotte says she didn’t honestly think she would be at SummerSlam and was only at SmackDown to have Becky’s back, but Carmella running her mouth has presented her with an opportunity. Flair claims that the Queen is back and she wants to reclaim her throne.